This is very good news for DD Freedish users that DD Freedish added 2 HD channels on DD Free Dish DTH platform. Both TV channels are available in high definition picture with mpeg-4 quality. 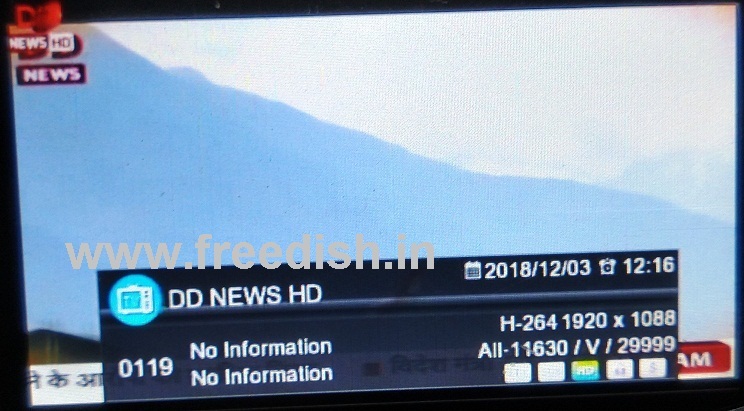 TV channels name are DD News HD and DOORDARSHAN National HD. These channels are receivable by only Free-To-Air Set-Top Box which supports MPEG-4/HD, DVB-S2, 8PSK. For LNB Frequency 5150-5150 users, use the below frequency to tune. So DD Free dish users can also enjoy HD channels without any monthly subscription. If you are not getting these channels means you are using mpeg-2 set-top box so you can upgrade your set-top box by buying online or offline. If you like this information then doesn’t forget to share with other viewers on Facebook and twitter. Namo tv not coming to my tv?